"Dani Carter was seven years old–her sister, Rose, seventeen–when their beautiful, impetuous mother, Maria, walked out of their lives, abandoning her husband and family for a love affair that would end tragically mere months later. Now, after decades Dani's own loveless marriage is faltering–propelling her into the arms of another and inspiring troubling thoughts of escape from her husband and beloved young son. Dani fears the sins of the mother have been visited upon the daughter. And, unlike Rose, who never speaks of their lost parent, Dani can't help but wonder who Maria really was. It's a puzzle that may soon be solved because, in a time of emotional and physical chaos, Maria, calling herself Mariah, is about to re-enter her daughters' worlds–bearing secrets and bitter truths... and, perhaps, long-awaited answers." 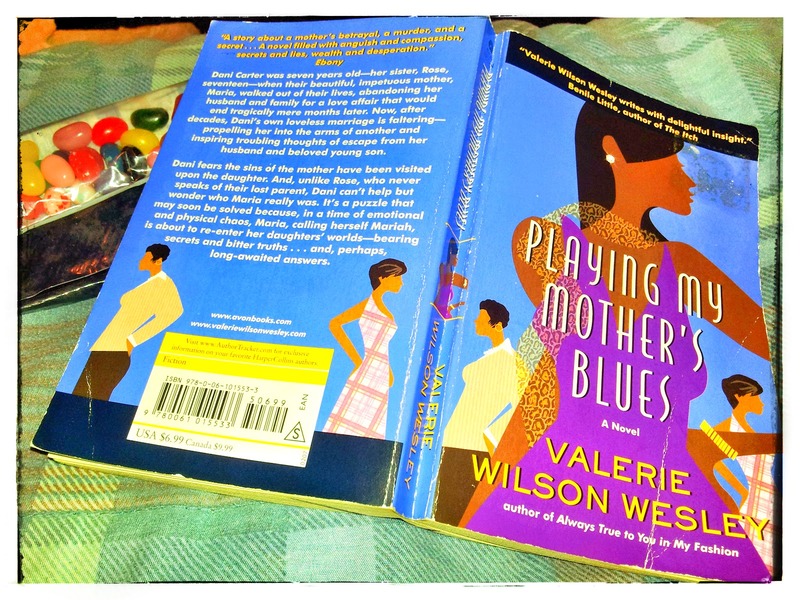 Playing My Mother’s Blues by Valerie Wilson Wesley was a… well… mmmm… well… it was a “meh” read. I just happened to slide it off the shelf (years ago, I saved the book from someone‘s donation pile), believing it would be a quick read to wrap up September. And it was, despite my boredom with it. As seen in the above blurb, the premise is appealing. Especially if you like stories featuring people of color and drama. Nonetheless, Playing My Mother’s Blues was nothing really unique. It’s one of Wesley’s contemporary African American novels. It’s told with the same familiar themes–concerning families and their secrets–seen in her Tamara Hayle mystery series. And in many ways, the story itself reflects her recently released, When the Night Whispers, book. So Wesley’s pattern is clear. And well... that’s pretty much it. It was the writing and characters that kind of came across as bland and forgettable. Neither one of them went deep into the offered material. I can sum the book up as simply as a mother walking out on her family due to an affair, and months later the affair ends. She loses the favor of her daughters, her daughters repeat her behavior as adults (and teens), she begs for the favor of her daughters. A plot twist is thrown in at the very end... and there you have it. The characters just never go too deep, and many of which come across as one-dimensional all the way to the very end. Though Wesley throws in some hard, tough issues for the characters to confront, everything seemed too safe and pain free. In all respects, Playing My Mother’s Blues was just a quick, easy read and not too much more. It was just a story; uncomplicated and wholly simple in its telling.